AGC Partners is pleased to announce that its client, Solutionary, the leading pure-play managed security service provider, has been acquired by NTT, the world’s largest global IT and telecommunications services company, in an all cash transaction. 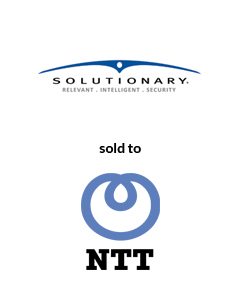 The acquisition of Solutionary will facilitate the continued expansion of NTT’s security capabilities as it seeks to become one of the world’s largest security integrators. Together, NTT and Solutionary will help clients of all sizes preemptively stay a step ahead of targeted security threats. With a team led by Maria Lewis Kussmaul, AGC Partners acted as the lead financial advisor to Solutionary.